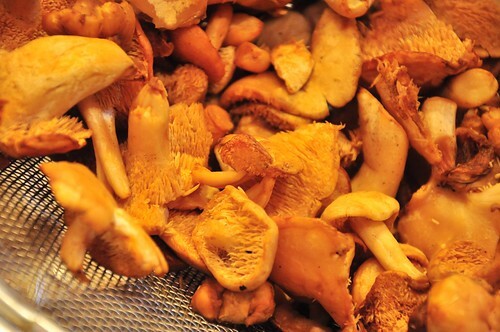 We went up to the West Side Market and scored these delicious Hedgehog Mushrooms -- which at first we thought were Chanterelles, but if you look at the gills you can tell they're spiky looking -- hence the name. 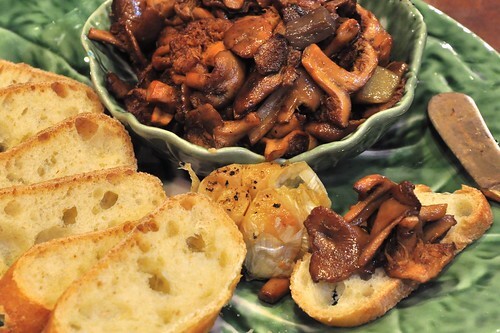 As an appetizer, we roasted a head of garlic to accompany the sauteed mushrooms along with a loaf of French bread we picked up at Great Lakes Bakery in Hudson, on our way up to the WSM. When making the pasta last night, we also made a second batch of plain pasta for our daughter who is not (yet) a fan of spicy things. Tonight we made the rest of that batch and added some fried mushrooms and cherry tomatoes to a simple nooch, earth balance & white wine sauce. 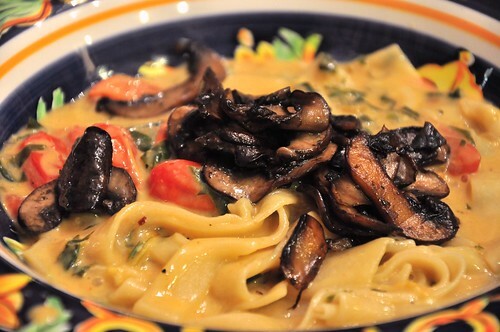 Which brings us to tonight's Vegan Test Kitchen -- Fresh Red Bell Pepper and Chipotle Pasta. 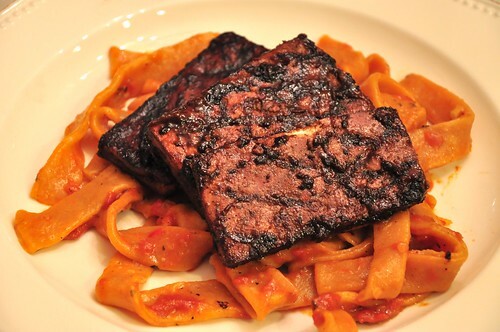 We started by roasting a red bell pepper on the stove until it was charred all over, and put it in a paper bag to let it steam for 10 minutes which makes it easier to remove the blackened bits later. After cleaning and seeding the pepper, we put it in the vita-mix along with 1 tsp. 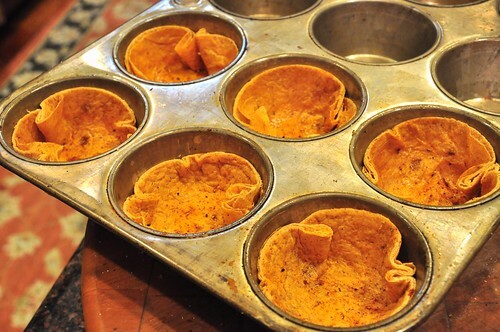 of dried chipotle powder and processed it until smooth, which gave us about a 1/3 cup of puree. The mixture will be very strong at this point, but that's a good thing. Liz decided to make a variation on her pierogi dough which would accept the puree better -- 2 1/2 cups of flour, 1 tsp. salt, 1 tbs. egg replacer mixed with & 2 tbs. 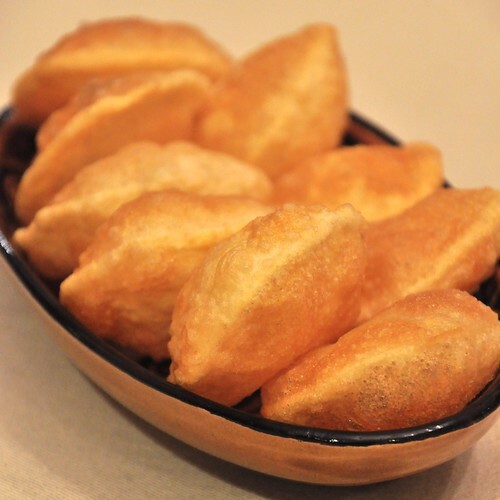 of water, 1/2 cup of soy sour cream and the 1/3 cup of pepper puree, kneaded into a dough on a lightly floured surface for 5-7 minutes -- the kneading was very instructive for me personally as I could really feel it start off "grainy" and progress towards a smooth dough. We wrapped the dough in plastic and put it in the fridge until dinner time. For the other half of the meal, I broke out the smoker box and cut a block of tofu into eight cutlets and smoked them with mesquite wood for 25 minutes. Saute the shallot & garlic on med-low until lightly browned. Add the cherries, agave, tamari and ancho powder and cook, stirring occasionally, until the cherries have broken down -- about 10 minutes. Add the fresh ground black pepper and check for seasoning and balance. You may need to add more agave (or brown sugar) depending on how sweet the cherries were. Add the cherry mixture to the blender and puree until smooth. 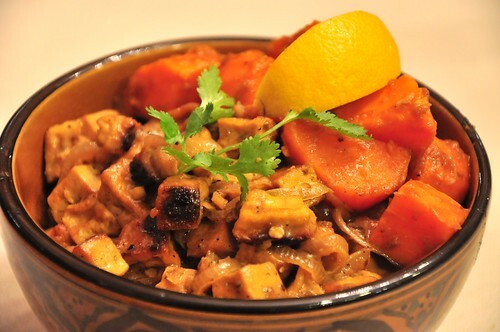 Pour the mixture into a shallow pan or plate and add the smoked tofu cutlets and turn to coat thoroughly. Let marinate for at least 20 minutes. Grill the cutlets, basting occasionally, keep an eye on them so they don't burn (because of the sugar). The pasta was taken out of the fridge and allowed to come back to room temp. 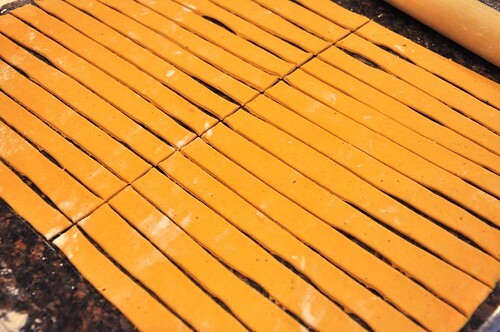 It was rolled out thinly and cut into strips (think tagliatelle) with a pizza cutter, as in the picture above. Bring a large pot of water to a boil, add a pinch of salt and cook the pasta in batches until it floats to the top. We made a quick tomato sauce with a little smoked paprika and dropped the hot pasta straight into the sauce, turned it gently to coat it fully and then it went straight onto the plate, topped with tofu. 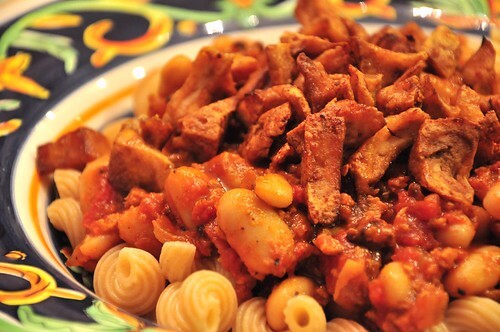 Things to think about for next time: a spicy tomato sauce may not have been the best choice as it competed with the pasta, but the pasta itself turned out really well -- and the pepper flavor did come through despite the competition. The glaze from the fresh cherries could have used some dried cherries to give it a little more tartness. Pretty close though. Much the same teriyaki as the other night, with the addition of Enoki Mushrooms on top. Also joining the party was a side of BBQ baby eggplants -- cut in half, marinated in a mixture of sesame oil, tamari, sherry, hoisin and then grilled. The eggplant turned out really creamy inside and tangy outside. 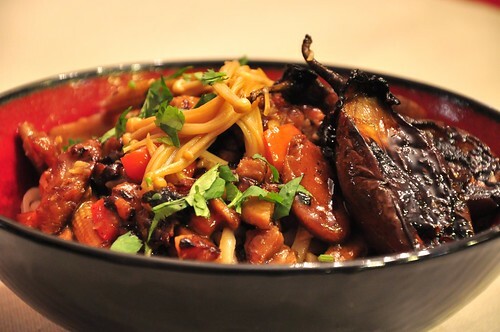 The trick is to go slow (time) and low (heat) -- you need to give it the time to cook all the way through so as not to burn or char the sauce on the outside of the eggplant. 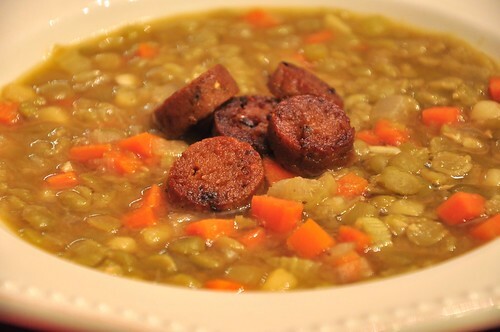 Winter and Split-Pea Soup is a timely match given all the snow we've had here lately. The pressure cooker took care of the green split peas which was added to sauteed onion, garlic, celery, diced carrots & parsnips. The soup was topped with fried seitan mini-sausages (from the earlier batch). 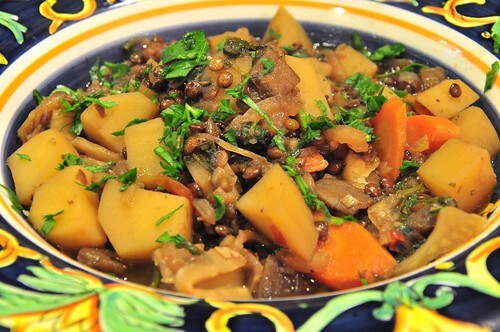 For a side dish, we made a batch of this wonderful parsnip dish from Urban Vegan -- Wait, what? You don't own this book yet? Go get it now! 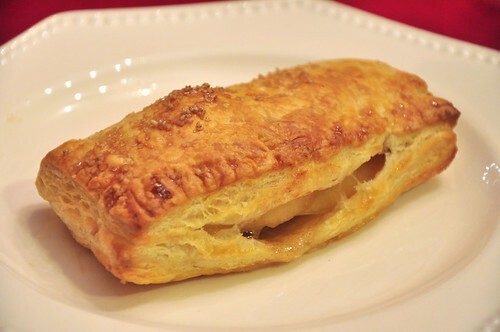 For dessert Liz whipped up a quick batch of chaussons aux pommes (French apple turnovers) using leftover puff pastry and Gala apples that were hiding in the back of the fridge. Sub out earth balance & Liz used a tiny amount of a flour & water mix in place of the eggwash. This is a riff on the recipe we made for lunch last week. There were a couple of differences. First, we cut the tofu into cutlets, then marinated them with a variation on our usual mix with canola oil, tamari, agave, ketchup, black pepper, minced garlic and a touch of sesame oil. The basic collard greens method stayed the same. In a wok on med-high heat add 1 tbs. canola oil, 1 tsp. garlic, 1 tsp. ginger. 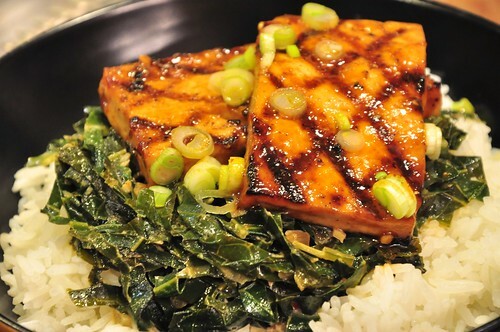 Cook for 30 seconds until aromatic, then add the thinly cut collards greens and turn constantly. Cook for five minutes, until the collards are softened. Add a splash of tamari, turn to coat, cook for one additional minute. Remove from the wok and keep warm. Next, the curry sauce that the collards are braised in was fortified. In the same wok, add 1 tsp. of canola oil and stir-fry 2 tbs. of shallots and 1 tbs. garlic until fragrant, then add 1/2 can of coconut milk, and whisk in 1 tbs. green curry paste (more or less depending on your personal preference), 1/2 of a lime, juiced, 1 tsp. of agave and a splash of tamari. Bring to a simmer and cook for 2-3 minutes until slightly reduced. Add the collard greens back into wok, turn the heat down to low, put the lid on the wok and cook for an additional 5 minutes. Check for seasoning. To plate, start with the base of jasmine rice, add the collard greens and pour some of the curry sauce over the top. One of the nice things about the curry sauce is how it soaks into the jasmine rice. Finally add the grilled tofu on top and serve hot. Today we were in "vegan test kitchen" mode. 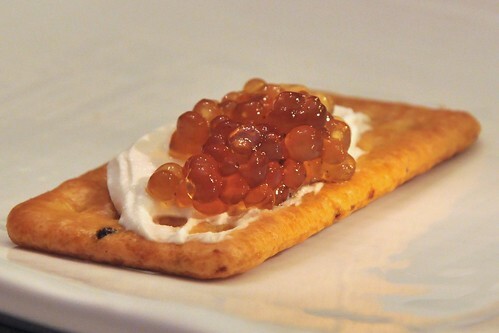 The caviar has been rattling around in my brain for a couple of months -- it goes back to an entry from the always interesting Ideas in Food blog which displayed a technique for poaching tapioca pearls with apple juice that was later used as a part of a soup. 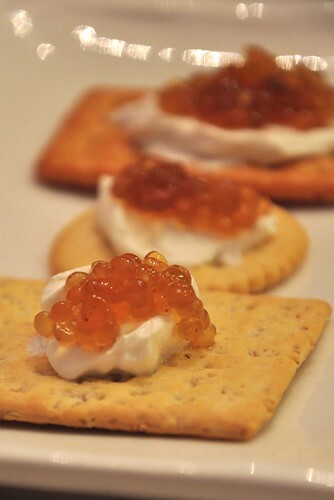 With blini and caviar (which from came from a jar) still fresh in our minds (and palate) from New Year's Day, the time seemed right to give this technique a try. Start by soaking 1/4 cup of (Bob's Red Mill) small tapioca pearls for 20 minutes in 1 cup of water. While that is soaking make the braising liquid. Start with a 1 cup of water in a small pot, and add a 2" piece of kombu. While that comes up to a boil, toast one sheet of nori, put it in a spice grinder and reduce it to a powder. Add the nori powder, along with 1 tsp. of loose black tea to the now boiling water. 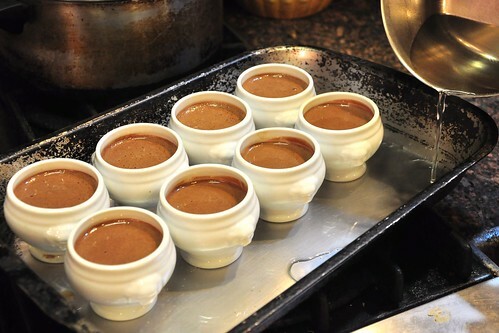 Turn the heat down to a simmer and cook for 5-7 minutes and reduce until you have about 2/3 cup of liquid remaining. Turn the heat down to low and add 2 tsp. of tamari (or 1 tbs. Braggs Liquid Amino's). 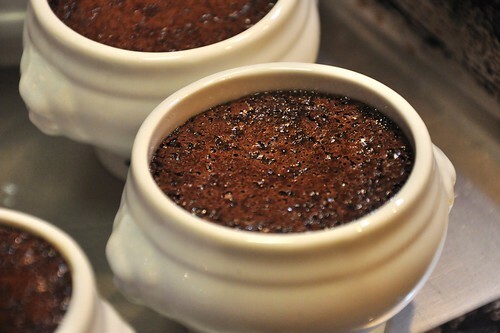 Adjust as needed, but be aware that the flavor will intensify the longer it sits. 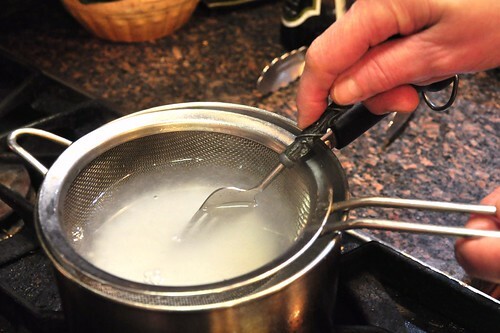 While the braising liquid is simmering, fill a separate pot full of water (almost to the top) and bring it to a boil, place a mesh strainer across the top of the pot -- which will allow the tapioca to be easily removed after each round of blanching (around 45 seconds or so) -- and blanch four or five times, rinsing the pearls off between each round, which will help to not overcook them. You'll know the tapioca is done when it turns translucent and loses all traces of the "white" inside the pearl. Immediately drain the tapioca and pour into a small saute pan -- make sure they're in a single layer -- and strain the warm soaking liquid over the pearls to cover. Let the caviar soak until it has come back to room temp, and then refrigerate for at least two hours -- or for a deeper color and stronger taste of the sea, overnight. 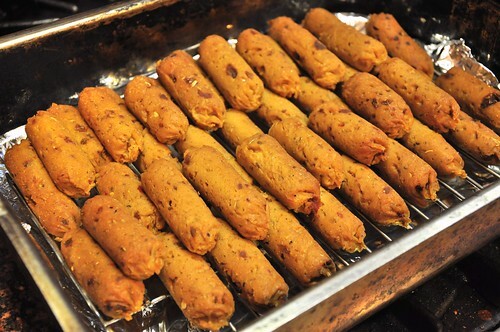 We made the seitan sausages (from Vegan Brunch) again, this time a double batch and smoked them in apple wood. 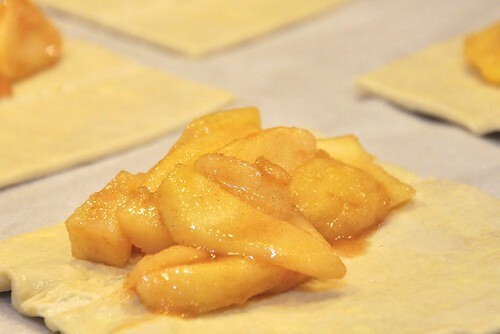 They were pan-fried, then wrapped in puff pastry and baked, like we did on New Year's Eve. But without the book cover shot. Finally, for dessert we took a stab at veganizing this recipe using soft tofu. Normally you would marinate the protein (in this case, seitan) and then grill or broil to finish. 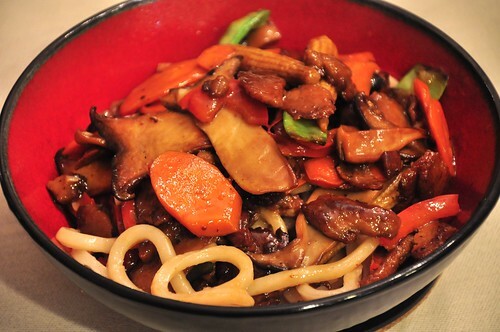 Tonight we poured it over the stir-fried seitan along with carrots, red bell pepper, king trumpet mushrooms, baby corn and a base of thick noodles. Recently, our oft-used 7qt. Kuhn Rikon pressure cooker began making strange sounds. We found out the bottom had started to ever-so-slightly warp around the edges of the core and was causing an audible (and disconcerting) popping sound. The prospect of being with out a pressure cooker was inconceivable (say that in Wallace Shawn's voice from "Princess Bride", it's funnier). Liz jumped on the phone to the usual suspects, but no one had one locally. Undaunted, she kept working the phones, until she found one in Pennsylvania which arrived two days later. The crisis was averted, and everyone can now stand down from DEFCON 2. To celebrate our new arrival, we made our favorite Indian soup using toor dal (a.k.a. yellow pigeon peas) in the pressure cooker. A combination of spices -- cumin seeds, coriander, smoked paprika and turmeric in this case (the amounts/spices depends on your preferences and what's available in your spice cabinet) -- are fried in a little oil until fragrant and then mixed into the pressure cooked dal along with salt. 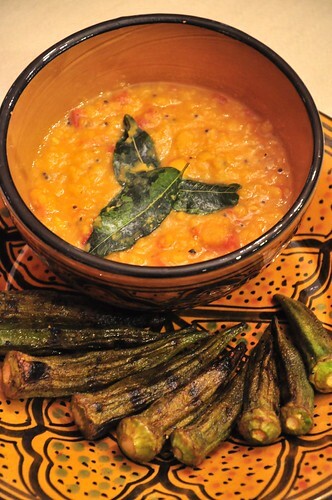 The dal was topped with fried onion seeds and fresh curry leaves. The okra was marinated in a mixture of 1 tbs. olive oil, 1 tsp. tamari, 1/2 tsp. cumin, 1/2 tsp. coriander and fresh cracked pepper to taste, and then grilled -- turning often, about 10 minutes total. A quick lunch using leftover basmati rice as the base. In a wok on med-high heat add 1 tbs. canola oil, 1 tsp. garlic, 1 tsp. ginger. Cook for 30 seconds until aromatic, then add the thinly cut collards greens and turn constantly. Cook for five minutes, until the collards are softened. Add a splash of tamari, turn to coat, cook for one additional minute. Add 1/2 cup of coconut milk along with a pinch of sugar. Turn the heat down to low, add the wok lid and cook the collards for another 10 minutes. Cut a block of tofu into small cubes and smoke with black tea for 20 minutes. Add 1 tbs. of canola oil to a wok and stir-fry on medium heat (turning constantly) until the tofu is golden brown (7-10 minutes). Splash with tamari at the end of cooking and toss for one additional minute. 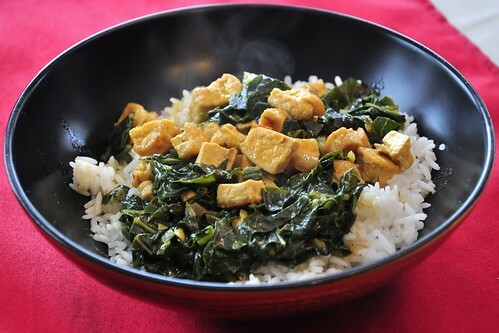 To assemble, start with the re-heated rice at the bottom of the bowl, add the collard greens, pour some of the coconut milk on over the greens and top with the stir-fried tofu. I won't bore you with the stir-fry (tea-smoked tofu, carrot, red bell peppers, carrots, baby corn, king trumpet mushrooms, garlic, ginger, etc), but there's always time for the Lotus Root chips. Liz took our daughter and her friends to CAM after school -- where amongst the Asian New Year's dresses, candy and day-glo colored "fruit" drinks with marbles (?! ), they somehow managed to bring home actual food, including a beautiful lotus root. The lotus root was slightly larger than normal, which meant I had to break out the mandoline rather than the smaller Benriner. I trimmed the end sections and peeled the outer skin with a vegetable peeler, revealing the pale rhizome underneath. Holding the lotus root at a 45° angle against the mandoline (with the blade set at roughly 1/16") will result in large, long chips. The first and last 1" sections don't look as cool -- but taste great as well. After cutting them, drop them in a chilled water bath so they don't discolor. Using a thermometer, heat the peanut or canola oil to 375°F in a large wok or pot. 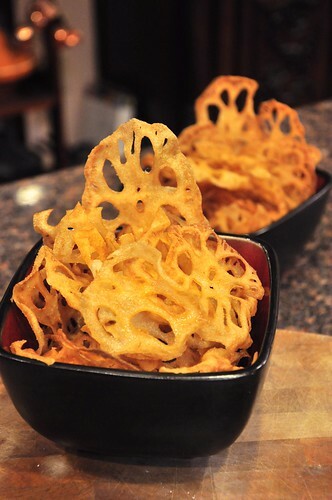 Remove the lotus root from the water, drain and pat dry before deep-frying. Working in batches, so as not to crowd the wok (causing the oil to dramatically drop in temperature), carefully drop the lotus root into the oil and fry about one minute, flipping over once -- you can tell they're done when the lotus root stop bubbling around the edges. Remove the lotus root from the oil and drain on paper towels or a wire rack -- they might look a little lighter in color than you want, but they'll continue to darken after you remove them. 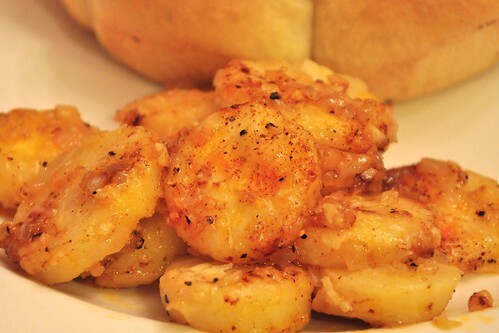 Immediately sprinkle with sea salt on both sides and serve. A riff on Maya Kaimal's recipe, subbing cubed and fried tofu for an otherwise vegan recipe. Both dishes were served on a bed of basmati rice. The base made, as usual, with our shiitake mushroom stock, enhanced with kombu, yellow miso, garlic, ginger and black pepper. 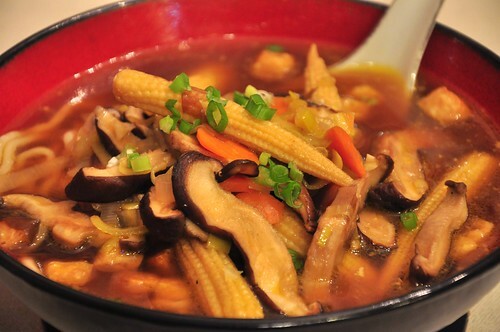 Rounding out the bowl was black tea smoked tofu, baby corn, shiitake mushrooms, leeks, miso, carrots, red bell pepper and udon noodles, all topped with scallions. 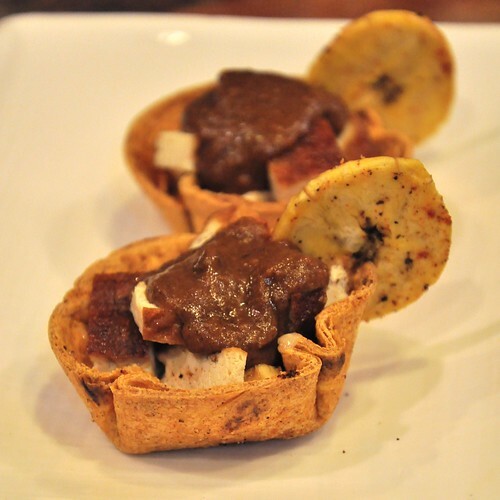 The recipe is here -- the only change was we used the tofu scraps leftover from cutting the rounds for the BBQ Tofu Lollipops -- they were also smoked, pan-fried and finished with tamari. A simple Mexican style meal tonight -- the quesadillas were filled with cheddar Daiya, sauteed button mushrooms, and rajas (thinly sliced and fried poblanos peppers, red bell peppers and red onion seasoned with Mexican Oregano, salt & pepper). The rice was a flashback to a dish from childhood: a spicy tomato sauce (ancho & chipotle pepper, smoked paprika) mixed with leftover basmati rice. 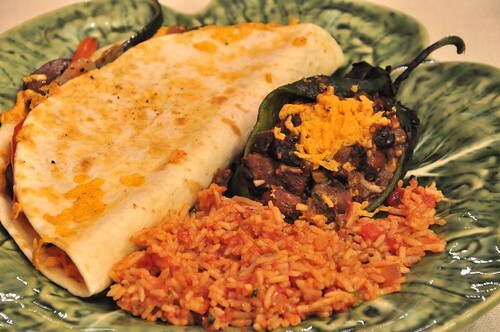 The chiles rellenos were stuffed with a mix of red onion, garlic, Mexican oregano, salt, pepper, pinto & black beans and cheddar Daiya and then put in the oven for 10 minutes @ 350F to heat everything through while making the quesadillas on the griddle. How was your New Year Day? 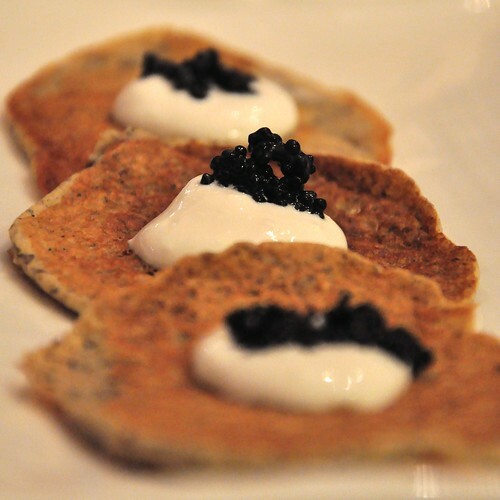 I spent part of mine making blini (from Veganomicon) and seaweed caviar, then drinking (more) cava.